We’re flying along with our tour of the trekking centre horses and today we’ve reached the appropriately named Jetwings – better known to you all as Galaxy. This gorgeous Irish x Arab boy is actually registered under the name Jetwings with the Arab Horse Society and he surely must be one of the most loved and popular horses at the centre. He has such a fan club! I truly believe that in life your animals find you and that most of the horses here were meant to be mine. And that is certainly the case with Galaxy. I had a phone call from a friend of mine who had a trekking centre in Wales. Rupert had bought a flashy coloured horse for his wife, but he was proving a real handful and was getting to be a little too much for her. Rupert just wanted to know how much a horse of that quality was going for at that time with a view to selling him on. My ears pricked up straight away. I knew that my friends in Wales had a real eye for a good horse. If they rated him, he was the real deal. So I asked for some photographs of him. The pictures came and I loved him straight away and I had even negotiated a price before I went to try him. Off I went to Wales, where I found everyone on the yard calling him “The Posh Horse”. 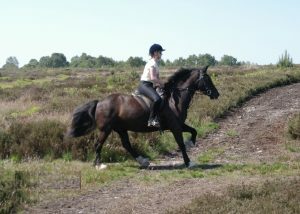 I rode him, bought him and had travelled there in a horse box so I could bring him straight home. Galaxy proved to be quite lively, so I started riding him myself and schooling him. I was tempted to keep him for myself, but to be fair I think that about most of them! I found him to be a super horse to ride, forward going, keen and bold with lovely paces and he soon became sensible and reliable. He is such a good looking horse, so handsome, and he has become very popular. I have a bit of trouble trying to get the clients to share Galaxy nicely! Everyone wants to ride him. 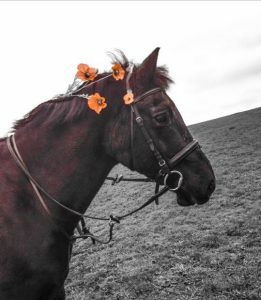 Let me introduce you to Yswain Gabriel – a beautiful name for a beautiful horse. Known to us all as Gabriel – or Gabs for short – this handsome boy is a Welsh Section D. Most people think he is black, but he’s actually chocolate. Gabs wasn’t a planned buy. As you will all remember from my earlier blog, I went to see Capulate at my favourite Section D stud. The owner took me round to see her mares and their recently born foals. I was greeted by a beautiful chocolate foal who wasn’t very old. He left his mum and came straight over to introduce himself to me. 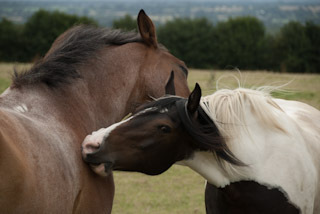 He was a lovely big foal and very bold and confident, following me around and wanting to be friends straight away. I had already made the decision that I was having Caps, so I bought them both together. Obviously Gabriel had to stay where he was with his mum, but once he was weaned he came to me and I turned the two of them away with the herd. They stuck together and became the best of friends and over the years have climbed the ranks to become quite high up in the field pecking order. At four Gabriel had turned into a lovely big Section D. The stud had told me that his mother always threw big foals so they had put her to a Welsh Section C stallion to try for a smaller baby. It didn’t work – Gabs just kept growing! 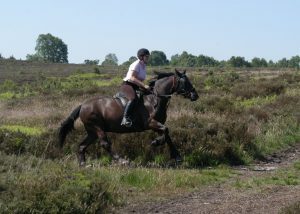 I have always found Welsh Section D’s a little bit quirky to break in, even though Gabriel was easy to get on and ride. They are inclined to be immature and not very laid back. They look at everything and question everything that is asked of them. Gabriel proved no different and for quite a few years he was limited to staff and our strongest riders. But gradually he grew up and matured and over the last few years he has become a firm favourite with a lot of our experienced riders. 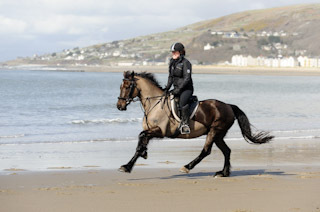 He has gone on to cope with the Sheriff’s Ride, trail rides and the Wales holidays. He has turned into a super horse, but it has taken time. My advice to anyone thinking of buying a Welsh Section D is to be prepared to be very patient. 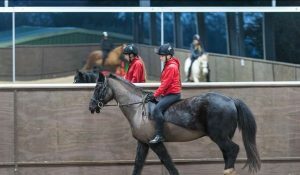 Even with the amount of work we can put into a horse here, Gabriel needed a lot of time and it has taken years to get him to where he is today. But it was worth every minute of it. He is so lovely now and a really special boy. Now we have reached E and there is just one – the elegant Emrys. 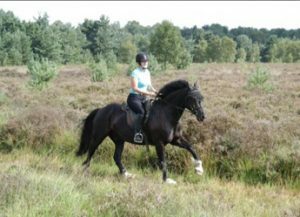 He is special to me as he is the last of my original trekking centre horses and he is still bursting with life and vitality. He was the very first horse I bought for the trekking centre, back in 1994, before I had even opened. He came from the Yswain Cob Stud and his full name is Yswain Emrys. He was just nine months old, a Welsh Section D, and I fell in love with him the moment I saw him. I have always loved black horses and he was the first I ever bought. Emrys was a shining, handsome colt who had won three times in the show ring, including at The Royal Show. His movement and conformation were jaw dropping. He was going to be the stallion I had always wanted and I was determined to keep him as an entire and show him. He was an expensive indulgence and I couldn’t resist his four white feet and his star. 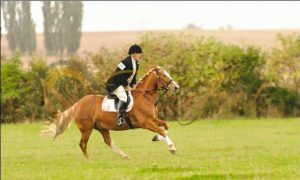 But Welsh Section D’s can be a handful as entires and by two he was a naughty nuisance, so I ended up having him gelded. I usually break in at four, but he was so mischievous I started working with him at three. Welsh Section D’s are among the trickiest to break, they can be very willful and opinionated, and Emrys was no different. I had to be very patient and think out of the box. 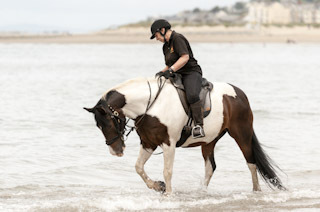 He used to buck quite a lot – some clients loved it for the excitement, others were terrified! Bugsy was his brother and the two of them were like a pair of gangsters. But eventually Emrys grew up and I look at him now and can’t believe he carries riders of such varied abilities. The fact that he is the last of the originals makes him very special to us here. And I have an extra emotional attachment to him. 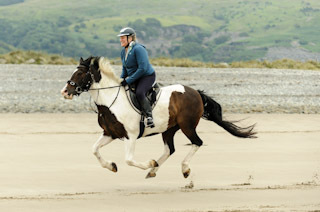 I lost my Dad in 1995 and Emrys was the only one of all my trekking horses that he saw. I often wonder what my Dad would think of my trekking centre and all the horses I have bought, so I am glad he saw Emrys. Dad knew his horses and he advised me to get Emrys gelded as he looked as if he could be naughty. He was right! 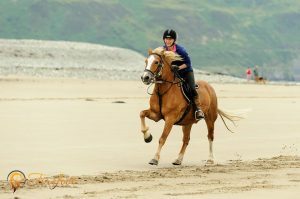 The last of our ‘C’ horses is the lovely Connor – a chestnut Welsh Section D.
This little horse is the perfect all-rounder in the trekking centre – reliable, calm and sensible for beginners and still a fun ride for the more experienced. I bought Connor when he was just a foal. A friend’s daughter did a little bit of horse dealing and she had two beautiful youngsters for sale. They had been weaned together and I bought them both. One was Connor and the other was a little coloured cob called McLeod. It was my sister’s 30th birthday and I bought Connor for her. It was a complete surprise – I tied a red bow round his neck to give him to her. I broke both of them in at four and Connor was perfect. He took the whole process in his stride but McLeod turned out to be a little bit too unpredictable for the trekking centre and I sold him. Connor worked really well the whole time I was training him. 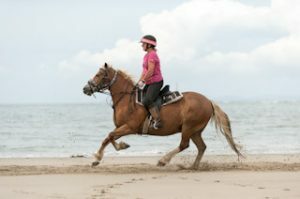 We started him off with my sister riding him as a lead horse on the treks and he has gone on to be an ideal trekking horse. He can do anything. He can carry children and adults, beginners and experienced riders. 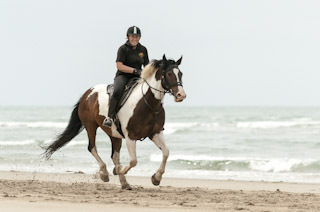 He does the Sheriff’s Ride, he can jump and he is proving invaluable in our new pony clubs and pony activity days. He is totally safe and trustworthy, brave and confident. Connor is the perfect gentleman, the sort of horse everyone would like to own. My sister doesn’t ride much any more but she would never let me sell him. She loves him too much.